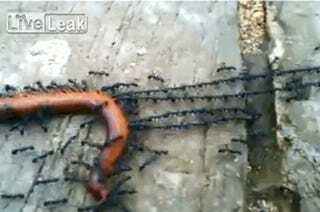 Individual ants are not very smart, but ants working together in a colony are capable of extraordinary feats. Case in point is this remarkable video in which a colony of ants have transformed into a daisy chain to pull a dead millipede — behavior that's never been seen before. Ants are what biologists refer to as a superorganism — a species that can only be understood by examining the sum of its parts. Ants are renowned for their ability to band together to complete tasks an individual member couldn't possibly hope to accomplish, like bandying together to carry large objects or forming bridges out of their bodies. But this chain-linking behavior, which appears to show a Southeast Asian species of Leptogenys ants, is completely new to science. Helen McCreery, a Ph.D. student at the University of Colorado, recently published a paper on all kinds of cooperative transport strategies in ants. In it she explains that at least 40 genera of ants work together to transport things, from two ants grasping something together to weaver ant workers who band together to "collectively carry birds, bats and snakes vertically up tree trunks." But McCreery says that this video shows something different. "To me, this behavior seems to be different from what's been observed in other ants (including the weaver ants) in an important way," she wrote to me in an email. "These Leptogenys are moving their prey by grasping onto ants, instead of all grasping onto the prey itself. One could argue that the chains occur because ants just grab onto anything attached to the prey they are trying to move, but I don't think that's what's going on here. Ants are very good at telling the difference between one of their sisters (another ant in the colony) and anything else. In my view, that makes this daisy chain behavior very different from other documented cooperative transport." McCreery is suggesting that this behavior is not an accident, and that it's likely indicative of a deliberate strategy. And indeed, by creating a daisy chain, the ants are maximizing their pulling force.